In 1983, I became an ordained minister in the Southern Baptist Convention, and I arrived there, ironically, thanks in part to the loving support of several good Mormons. Prior to my ordination I had studied in a variety of schools including Bucknell University, Bangor Theological, Pacific School of Religion, Jesuit School of Theology, and Golden Gate Baptist Theological Seminary. I had come from a broken family. I had lived and studied with a variety of Christians, Jews, Muslims, Buddhists, Agnostics, Atheists, and even some loving Grateful Deadheads. In the wake of the Reagonomic program cuts I worked ecumenically and with the private sector to bring social services back to the communities of North Seattle. Ironically, I received a citation from President and Nancy Reagan for a job well done. I even married a Roman Catholic. However, looking back I would not say I was a fully mature Christian, not before or after my ordination. Does one ever truly arrive at Christian maturity? I certainly was earnest and energetic, but I was by no means a finished product. Even today I can cite moments of failure, of lapsing into relative Christian immaturity. No matter how good is my ideology, no matter how progressive, how conservative, how broad-minded, or how self-disciplined, sometimes my way of looking at things stands in the way of my being a mature Christian. I need daily inspiration and strength. No doubt this is why Jesus taught his disciples to humbly pray “Give us this day our daily bread, and forgive us our trespasses as we forgive those who trespass against us, and lead us not into temptation…” These are the prayed words of an endlessly maturing Christian. There was a time in which I would have agreed that Mormonism was a cult (a label meaning “not really Christian”). I would have looked askance at Mitt Romney. My mind would have been occluded by suspicion and pre-disapproval. There was a time, even after studying the original Greek text of the Apostle Paul’s letter to the Philippians, that I did not fully grasp the essential attitude of a mature Christian. Namely, I did not fully grasp or always practice what it means to “esteem others as better than yourselves” (Philippians 2:3b). I still do not fully grasp or always practice esteeming others as better than myself. Can you imagine what it would be like if Congress would find such moments amongst themselves? Nevertheless, I think the historical record correctly shows this kind of esteem for others in the life of Jesus, especially during his final moments on the Cross. I also have known some wonderful people who have esteemed and loved me this way even when I did not deserve it. I now think Mitt Romney would be an very fine candidate for the Presidency. He surely deserves a fair and clear opportunity no matter what his brand of Christianity. Not that Mitt Romney is preaching any brand at all — he is not as far as I can tell. I would also say I find it ironic that in his letter to the Philippians, the Apostle Paul said he rejoiced over the prospect that there were some preachers (triumphalists in Philippi) who preached about Jesus for profit or to breed contention. Did Paul cast aspersions on their character? No. “What then? Notwithstanding, every way, whether in pretense or in truth, Christ is preached; and in that I do rejoice, yes, and I will rejoice” (Philippians 1:18). Paul instead rejoiced in that they were preaching the gospel of Jesus at all. Instead of passing judgment Paul encouraged a very special brand of esteem and patience for others. 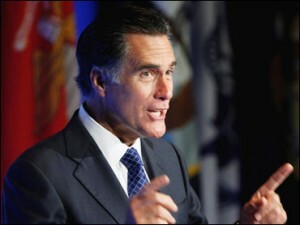 So who am I to judge Mitt Romney for being a Mormon? Let us esteem the man and give him the opportunity to run a fair race run on the real issues. Vince DePalma is a Catholic ecumenical writer. Baptized and confirmed, he suffered a broken family at age 15 and lived with a Protestant foster family until graduation from high school. Vince attended Bucknell University, Pacific School of Religion, Jesuit School of Theology, and Golden Gate Theological Seminary. He was Director of Christian Social Ministries in Seattle, for which he received commendation from President Ronald Reagan and was a minister in the National Parks System when he met his wife of 21 years, Patricia. They were married at St. Charles Borromeo Church in Tacoma, Washington and have three children, Victoria 19, Rebecca 14, and Joseph 7. He can be reached at vjdepalma@gmail.com.